There are more classic cocktails made with gin than with any other spirit, and after a time out of the limelight, gin is bouncing back with a vengeance. Gin is a spirit which derives its predominant flavor from juniper berries . From its earliest origins in the Middle Ages, gin has evolved from use in herbal medicine to an object of commerce in the spirits industry. Gin was developed on the basis of the older jenever, and became popular in Great Britain (particularly in London) when William of Orange, leader of the Dutch Republic, occupied the English, Scottish, and Irish thrones with his wife Mary. Gin is one of the broadest categories of spirits, represented by products of various origins, styles, and flavor profiles that all revolve around juniper as a common ingredient. Classic retro cocktails mixed with premium gins in stylish glasses are back in fashion and a new wave of premium gins are taking over. Our craft distillery specializes in farm to still products where all of our grain is shipped from a local farm just south of our distillery. Unlike some other craft distilleries, we distill, age, bottle, and label all of our products by hand right here in Rochester, New York in our production room. We do not, and never plan on shipping in any spirits from large scale production companies. Our premium New York State Distillery promises to continuously deliver quality spirits that can be responsibly enjoyed by appreciators of fine alcohol. Jason Barrett has always found Gin to be an acquired taste. That is why he has given this spirit a new twist for gin lovers and an excellent starting point for the more inexperienced gin drinkers. The blend of bitter orange peel, sweet orange peel, and New York State Cascade hops molds well with the delicate notes of juniper berry. The unique blend of botanicals leaves you with a long lingering “citrus forward” taste at the end. 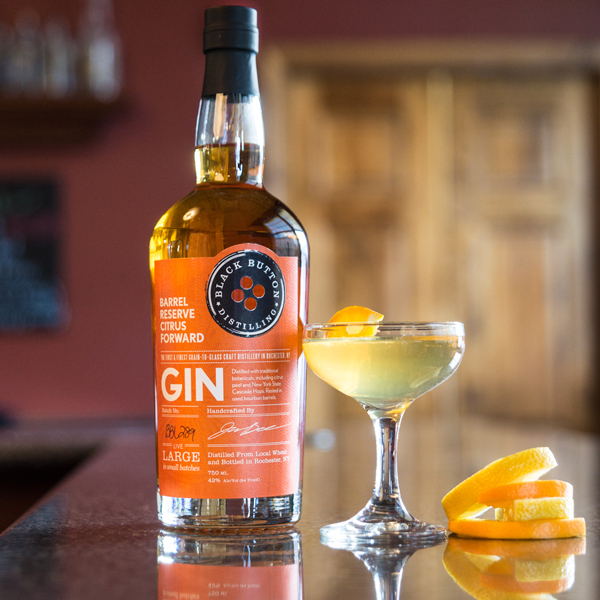 It’s the citrus overtone that makes this gin ideal for any hot summer day. Whether it’s in a Tom Collins, Gin & Tonic, or Gimlet, Black Button Gin will have you pondering what else Gin can do. It’s a Gin that both experienced Gin drinkers and newcomers can enjoy. Black Button Barrel Reserve Gin holds a special place in our hearts. The combination of our two true small batch distilling loves. The bright fresh pop of our Citrus Forward Gin, and the smooth subtle woody notes that only a bourbon barrel can supply. Our classic Citrus Forward Gin, but enhanced by resting in our used Bourbon barrels for a period of time. This aging of the Gin brings out some Bourbon qualities like Oak, Vanilla and Chocolate, not typically associated with a Gin. We find these qualities make this Gin an easy sipping Gin served neat, on the rocks, or mixed in your favorite cocktail. Made in limited quantities each Spring as an homage to Rochester’s rich floral history, Lilac Gin has sweet aromatic notes of warm weather lilac and lily blooms. A delicate palate of lavender, citrus and a hint of rose gives a gentle floral finish. Rose, Hibiscus, Lavender and Lilac as well as Juniper, Coriander and a myriad of other botanical components make this one of a kind spirit highly sought after. Make sure to get yours before we run out. A smooth, super refined spirit distilled from the finest New York State corn. Crafted in small batches to maintain its crisp and clean quality, our All American Corn Vodka is the perfect companion to many classic cocktails like a spicy Bloody Mary, tangy Moscow Mule, citrusy Screwdriver or bold Martini. 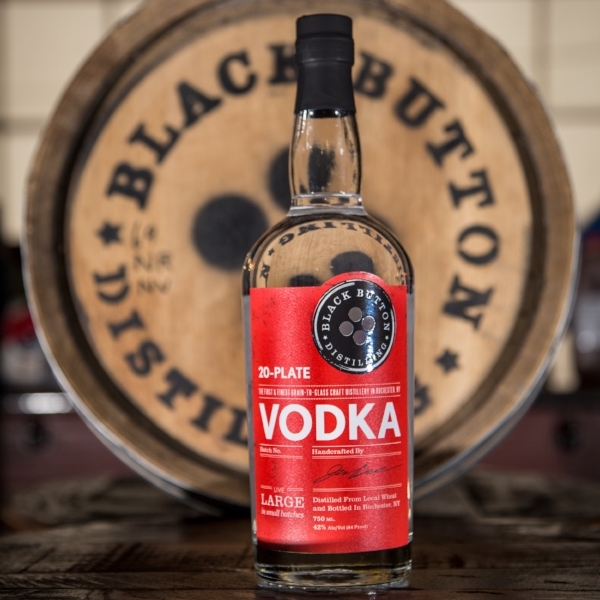 Black Button Wheat Vodka is a suprisingly smooth foundation you can build your drink and your evening on. Black Button Wheat-based Vodka is made from soft white wheat grown on a family farm situated on the western slopes of Conesus Lake. It is this local grain that gives us the smooth taste, body, and feel that every distiller desires for their Vodka, and we are proud to have such desirable grain growing right here in the rich soil of the Finger Lakes Region.